What Are Compressionn Socks? – The Complete Guide! Compression socks or stockings are worn on your feet. Just like regular socks, in most cases, they even look like regular socks, only that they’re.. perhaps longer. The key difference is that they compress your legs, unlike regular socks. Normally, the compression is stronger at the lower part of your leg (ankle) and gets looser towards the upper calf area. It is so, to help you with blood flow, but more on that later. Many people wonder what do compression socks do and who actually wear them. They’re worn by people with blood circulation problems, athletes, pregnant women, pilots and many more. Also, they come in different compression levels, which really is something to look into when choosing compression socks. I’ll cover most of these topics below, in this article. To help you get a better sense I’ll quickly explain how blood flow works. You see, it all starts with the heart. 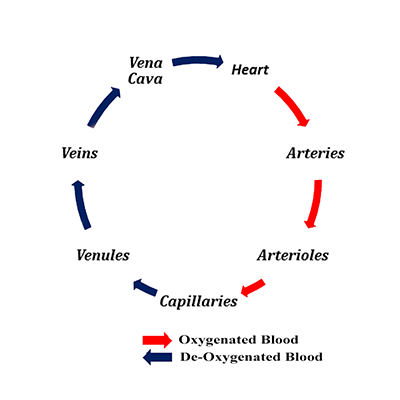 It pumps blood with oxygen, and then distribute the blood to different parts of your body. Our muscles get the blood through arteries. When cells in our muscles and extremities use oxygen (along with other nutrients that the blood provide), they produce byproducts such as deoxygenated blood, lactic acid etc. All of that stuff then gets taken back to the heart through our veins, where the blood gets oxygenated again and the circle continues. It should come as no surprise that oxygen in your blood is good for your muscle performance. It actually goes like this – the more oxygen is in your blood the better your muscles will perform. However, when you exercise your blood produce lactic acid. It makes your legs all sore and uncomfortable, as well as they increase muscle recovery period. Therefore acid needs to be removed. Also, think about muscle vibrations for a second. They’re also caused by exercising and physical activities. They are the ones that make you tired at the end of the day. With constant compression, the walls of the arteries stretch, which in turn helps to increase the blood flow that goes through them. In one research conduct by the niche experts, there was seen as high as 40% increase in arterial blood flow during physical activity. And you know what that means – a lot more oxygen to your muscles!! Compression socks will also help to increase the blood flow velocity that goes through your veins. If you remember, they were the ones who helped you clear your muscles from lactic acid. So quicker recovery and less soreness. I did previously mention muscle vibrations. Compression socks will stabilize your muscles, so they vibrate much less and your legs are less tired. Venous Insufficiency Veins can’t really get the deoxygenated blood from your legs, back to your heart. Edema Some people get swelling in legs thats caused by edema fluid(plasma water). There are multiple reasons why someone might have this problem among which are venous insufficiency. Do compression socks help Swelling? Varicose veins Leg Veins get enlarged and twisted. You can really see their outer shape. This is due to veins inefficiency to pump the blood upwards from your leg, so the blood flows backward and your veins get bigger. Graduated compression stockings have helped many people with this condition. However, if you have some sort of arterial disease. You should be really careful with compression wear. Deep veins thrombosis Blood clot aka thrombus development, due to diminished blood flow in legs. Can compression socks help DVT? Many medical experts prescribe compression stockings to help with the swelling and pain in legs as well as for post-thrombotic syndrome prevention. Lymphedema Lymphedema is a medical condition when lymph liquid accumulates in legs or any other part of your body, in fact. The body part then gets swollen. Do compression stockings help lymphedema? Compression socks can help move lymph fluid from the swollen area back into the body. However, if you have this condition you most definitely should talk to a doctor before using compression socks. In fact, if you choose the wrong level of compression you can even make things worse. ECS or Economy class syndrome Due to long flights and all the things that come with them blood flow is slowed down in legs. For this reason, many people choose to wear compression socks when traveling. Pregnancy Hormones and excess pressure, caused by pregnancy, often affect leg veins. Stockings can help, however, to get the best result they need to be worn for the whole day. On our website, we have created an article – best compression socks for pregnancy. I advise you to check it out. 8-15 mmHG -> Light Compression , socks will simply make you feel good. Also they’ll helps with controlling minor swelling and give relief to your tired legs. 15 – 20 mmHG -> Not a major difference, they’ll provide relief from tired legs, great for hiking traveling, walking long distances. 20 – 30mmHG ->Most often prescribed level of compression. Great for preventing venous thrombosis during traveling. Might give relief to even severe case of varicose veins and swelling, edema, lymphedema, venous insufficiency, superficial thrombophlebitis. At many times they’re prescribed to prevent venous stasis ulcers. 30 – 40 mmHG Should only be worn when prescribed by a doctor. They’ll help you with more serious varicose veins. As well as with Post Traumatic Syndrome (PTS) which mostly affects your skin. 40 – 50 mmHG Again only should be worn when prescribed by a doctor, to help you with more severe cases of previous mentioned problems. How much compression in socks do you need? You should always go with the lowest amount of compression that works for you. With that said – I will mention a technique that will help you to determine how much compression you might need. Measure an area of your leg in the morning, for instance – ankle. If there’s more than half inch difference in swelling by the evening, you might want to go with the 20 – 30mmHg socks. However, if the difference is only slightly noticeable, go with the 15-20mmHG ones. If you notice that the pressure you’re using is not really helping, go with the ones that are one compression level higher. Compression socks can be a welcome form of relief for an array of ailments. They can be beneficial for athletes looking for some additional support or to improve their performance and recovery times. They can also relieve the symptoms of various medical issues, though they are by no means a cure. 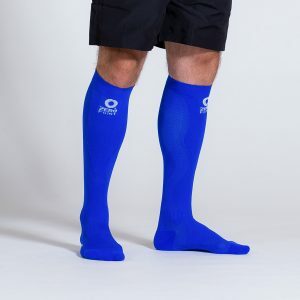 Even if you aren’t an athlete or suffering from a medical condition, you might want to take a look at compression socks. People who find themselves seated for long periods of time can benefit from the circulatory aid offered by these simple, often fashionable garments. What are Compression Shorts and How to Wear Them?